Quick Takeaway: I read this for a book club that I lead for the library. While it did meander at times, I enjoyed it overall and we were able to have a great discussion for our book club. Who Should Read This? This is a great read for art lovers and those looking for a mystery that focuses more on character than plot. Review: While this is a mystery, it is not very traditional. I absolutely love mysteries, but I was much less interested in the mystery aspects of this book than I was the central characters. 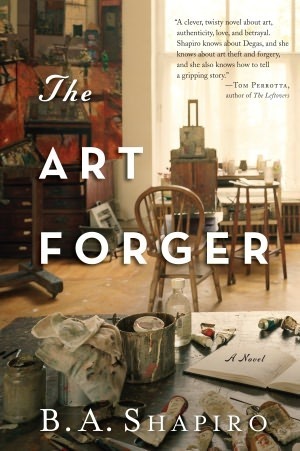 The main character Claire, a professional art forger whose career is legally forging famous art for commercial purposes, is commissioned to forge a famous stolen painting. The circumstances under which she is asked to perform this task are suspect, but she finds herself falling for the enigmatic art dealer Aiden Markel who may not be as he seems. I really enjoyed the character of Claire. She was sympathetic and she was really put through a lot of relatable tragedies. She is a very talented artist, but she has a terrible reputation in the art world, and she struggles to overcome the decisions she’s made. I also really enjoyed learning more about the process of painting, especially the process of forgery. I’ve dabbled in abstract painting but only as a hobby, so I felt like this was a really interesting learning experience about the world of art, especially classic art. Final Thoughts: I don’t think this book will appeal to everyone. If someone loves a good traditional mystery and has little interest in learning about the creation of art, this may be a bit of a letdown. However, if you’re more interested in character and you’re fascinated by art, go ahead and give this one a try!